NordicFuzzCon (abbreviated NFC) is an annual furry convention that takes place in Sweden. Its first iteration was in 2013. It is the largest Scandinavian furry convention and the third-largest in Europe, with 1,149 attendees in 2019; roughly a quarter were Swedish, while another half hailed from Germany, Norway, the UK, Finland, and the Netherlands. NordicFuzzCon's mascot is a lovable mouse-like creature known as "Mausie". Mausie has grayish fur, brown eyes, and has a blue bow tied to his tail. 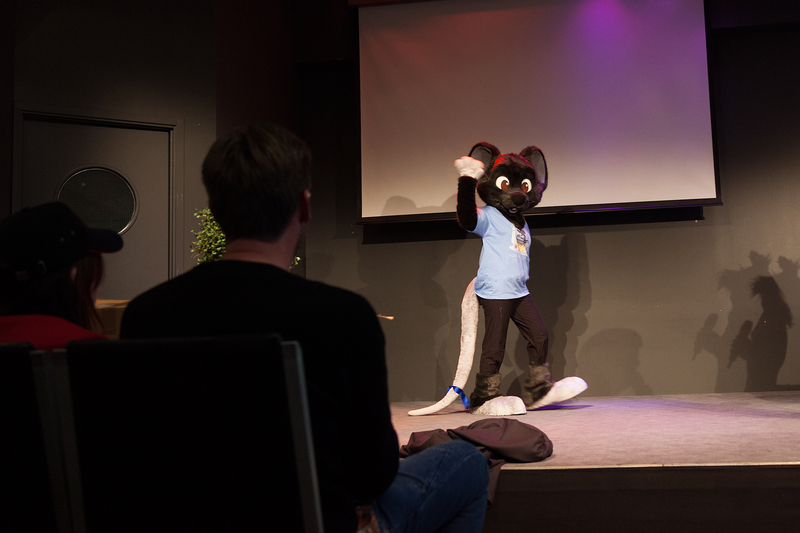 Mausie premièred as a fursuit during the opening ceremony of 2015. Mausie has his own reference sheet located here. In 2017, NordicFuzzCon had Japan as the theme and introduced a game called Fursuits - Gotta Catch 'Em All. The way the game works is that each participating fursuiter gets a code written on their fursuit badge, and all attendees can enter that code into the NordicFuzzCon phone app or website to "capture" the fursuiter. When signing up as a hunter, attendees also chose a team to join. The game features lists of the most active hunters, most caught fursuiters, and the team with the most amount of points. As of 2019, seven instances of the convention have taken place. An eighth is announced for 2020. NordicFuzzCon (802467-4924) is a Swedish non-profit organization (ideell förening), registered 30 August 2012. Its subsidiary interest organization, NordicFuzzCon AB (559041-6425), a private company limited by shares, was registered 15 December 2015 and is led (as of 2018) by CEO Trax (Patrik Fomin) and vice-CEO Miles T.F. Baxxter. The organization's fiscal year ends June 30 - its 2015-16 report was signed by directors Trax, NewEinstein, Miles and Pinky Fennec; head of security Clover succeeded NewEinstein for 2016-17 and '17-18. While not a signing member of NordicFuzzCon AB, Ethan Staghorn has also been a member of the NordicFuzzCon board since the first convention. As of June 2018, NordicFuzzCon AB held 350 045 SEK (~10% of 2017-18 expenses) in cash equivalents, with liabilities of 107 454 SEK (tax and 20 000 SEK in accrued expenses). It made 3.68% profit on revenue of 3 617 181 SEK (vs. 10.43% on 2 923 101 SEK in '16-17). ↑ NordicFuzzCon 2013 webpage, retrieved 2013-05-09. ↑ NordicFuzzCon FAQ on the NordicFuzzCon website. Retrieved 2014-03-23. ↑ NordicFuzzCon Gallery Mausie meets the public. Retrieved 2015-03-23. ↑ Conversation with GreenReaper at NFC 2019, and its closing ceremony credits.